My favorite book on goldwork in my library is Goldwork Embroidery by Mary Brown. I like it because she’s included so much varied information. The first section of the book is about the history of goldwork from the 12th century through to the 20th century. She then writes a detailed and clear chapter about the history and construction of metal threads. I love learning about how the materials we use are made! Following all this historical information she discusses materials, equipment and preparation techniques for goldwork. The final chapter of the book (before the specific projects that are so inspiring!) is a chapter on goldwork techniques. From my perspective this is the most valuable part of any of the books I have in my library. Her instructions are detailed and really clear; I often refer to them when I’m unsure about something I’ve learned but can’t quite remember. If you’re interested in her design, kits etc. check out her web site. 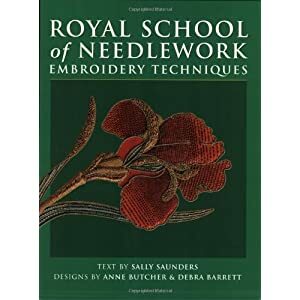 The Royal School of Needlework Embroidery Techniques book is a good basic text about different kinds of embroidery. The section on goldwork is brief in comparison to Mary Brown’s book. There’s an introduction to goldwork, including a short history, a section on how to approach goldwork and information on the different threads. Following the general information there are five projects ranging from an exercise for beginners to a very difficult and complex purse. Tracy A. Franklin is well known for both her impeccable technique and her innovative application of traditional techniques. 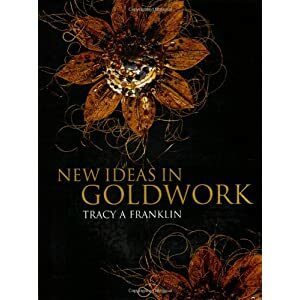 I’m really looking forward reading this book and seeing her work in New Ideas in Goldwork. To see Tracy’s work, go to her blog and feast on the gorgeous photographs. Jane Lemon is well known as a teacher, ecclesiastical embroiderer and designer. Her book Metal Thread Embroidery was reviewed by Mary Corbet and she loved it. You can read the review here. One of the things Mary mentions in her review is a section of the book for travelers entitled “Places to Visit”. It’s a list of places around the world where one can see goldwork embroidery. This sounds perfect for me! I can’t wait to sit down with a cup of tea and this book! There they are; the four text books we’ll be referring to during our course. Would you have recommended any others for those of us on the course? There’s one called “All that Glitters” by Alison Cole that I’ve found useful and interesting as well. I went to the exhibtion at Rugby and saw work from all four of the techniques. All the work is beautiful and it was a pleasure to see your work Kathy. I’m glad you enjoyed the exhibition! Like you, I have two of those four books. Thanks for posting these as I added the other two to my wish list. I’m taking my first goldwork class in the fall and I’m getting excited. I can’t wait to read about your experience in the goldwork course. I loved the last one on crewelwork. I’m starting the certificate course in September. I can’t wait! You will just love the course! The people are so great and you’ll learn so much and reinforce what you already know. Where will you be taking your classes? I’m going to Hampton court and I’ll be doing a class every couple of weeks so I’ll have plenty of time for homework (I hope! ).